Despite accurate preoperative assessment and adequate preparation, unexpected, and sometimes disastrous, situations can occur during vascular and endovascular procedures. This latest book in the European Vascular Course series provides vascular and endovascular surgeons with the skills and techniques needed to solve these unforeseen intraoperative complications. It includes thirteen chapters on aortic neck problems during open and endovascular repair, ruptured clamp sites, ureteral lesions, unintentional covering of side branches, totally calcified aorta and embolization. Accidental conditions during carotid and lower limb revascularization are also covered in six chapters and additional challenges are described in another seven chapters. 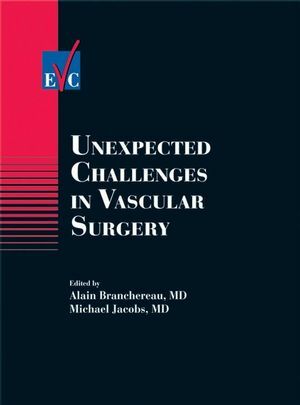 Alain Branchereau and Michael Jacobs are the editors of Unexpected Challenges in Vascular Surgery, published by Wiley. Chapter 1 Aortic neck problems during open surgery (excluding ruptured AAA). Chapter 2 Aortic neck problems during EVAR. Chapter 3 Unexpected anatomy and aortic surgery. Chapter 4 Complex endovascular grafting of the thoracic aorta: inadequate landing sites and aortic dissection. Chapter 5 Late aortic wall perforation after thoracic endoaortic reconstruction. Chapter 6 How to deal with ureteral lesions during and after aortic reconstruction. Chapter 7 Unintentional occlusion of the renal arteries during EVAR. Chapter 8 Ruptured mycotic aortic aneurysms. Chapter 9 Reconstruction of the totally calcified aorta. Chapter 10 Challenging aortic clamping in ruptured AAA. Chapter 11 Distal embolization during aneurysmal surgery: from blue toe syndrome to fatal stroke. Chapter 12 Paraplegia and stroke occuring perioperatively during thoracic stent grafting. Chapter 13 Unexpected difficulties during laparoscopic aortic anastomoses. Chapter 14 Abnormalities requiring immediate correction based on intraoperative control of carotid reconstruction. Chapter 15 Unexpected situations after carotid PTA. Chapter 16 Unintentional coverage of the carotid artery during stent grafting. Chapter 17 Critical limb ischemia with totally calcified arteries. Chapter 18 Occlusion of the leg arteries during infrainguinal PTA. Chapter 19 Unexpected causes for acute ischemia. Chapter 20 Luck, intuition or systematic approach: what is behind the successful management of an unexpected challenge in vascular surgery?. Chapter 21 Steal syndrome: the sword of Damocles of arteriovenous access surgery. Chapter 22 Unexpected challenges in arterial surgery performed without previous angiography. Chapter 23 Arterial dissection and rupture during endovascular procedures. Chapter 24 Stent and endograft displacement and migration. Chapter 25 Endovascular aids for controlling open surgical bleeding.